They say: ““The Family Cow is a certified organic, grass based, PA Department of Agriculture (PDA) permitted, raw milk dairy. The farm is situated on 122 acres of certified organic pastures. The farm’s 75 Jersey milk cows are rotationally grazed 8 months out of the year. An additional 300 acres of organic land is farmed to assure an abundance or high quality organic stored grasses to grass-feed the cows during the winter. The dairy is owned and operated by Edwin and Dawn Shank and their 6 children and has been continuously owned and farmed by the family for 5 generations and close to 100 years. 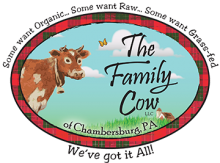 In early 2018 the Pennsylvania Association for Sustainable Agriculture (PASA) announced that the The Family Cow was a 2018 recipient of their PASAbilities Award that honors businesses and individuals making meaningful contributions to sustainable agriculture in the state and beyond. The awards was presented at PASA’s 27th Annual Farming for the Future Conference, held in State College, PA on February 7 through 10. This brand’s products can be found at farm stores and drop-off sites throughout Pennsylvania (check the listed website for details on how to obtain their products). Extra Credit 175 OSP submitted, very transparent. With respect to the concern of fraudulent grain imports, this dairy is 100% grass fed and produces all of their own feed on-farm.